Rock!!! grew up listening to the music of my brother. I like listening to all sorts of music, I try not to limit myself to just one type. Mukamo (in hiatus/disbanded), forming a new one. Most beats/groove from drummers listed above. (disturbed/mudvayne/pantera/dream theater/drowning pool/SOAD/STone Sour etc...) *Any type of music could influence one.. It's the beat that counts! now known as còy.. sinabi ko na..
with Zildjian and Wuhan cymbals, Gibraltar stands, Pearl pedals, Remo and Evans drumheads, LP percussions, Lazer, Pulse, Vater drumsticks, Matrix Metronome, & Green Cross cotton balls for ear muffs. Additional info about myself: i cook and play piano as well. sali nga ako dito pede?? I'm a proud drummer because: I play for God! My drum gear: NEVER PA KO NAGKAROON NG SARILING DRUMS....AS IN NEVER IN MY ENTIRE LIFE!!! I'm a proud drummer because: WALA AKONG DRUMS, WALANG TEACHER SA DRUMS, NEVER STUDIED SA MUSIC SCHOOLS PERO MARUNONG AKO MAGDRUMS AT OK NA OK ANG BANDA KONG CROSSED FINGERS! wooohooo!!! thank you LORD!!! 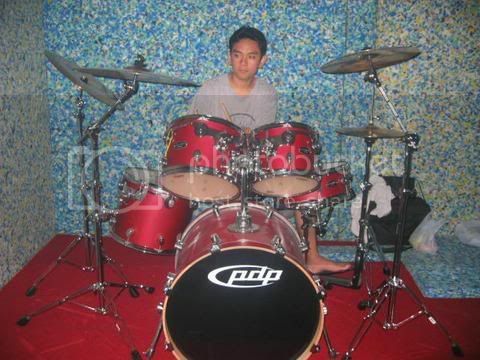 I've been a drummer since: learned drum when i was 14 but I pursued the instrument last 2004. My favorite drummer/s: Vinnie Colaiuta, Jojo Mayer, JR Robinson, Jeff Porcaro, Manu Katche, Kenny Aronoff, David Garibaldi, John BLackwell, Ernie Severino, Harald Huyssen, Franklin Benitez, Wendell Garcia etc. My musical influence/s: Hillsongs United, Sonic Flood, Jars of Clay, mostly Christian Audio. I'm a proud drummer because: Its a special gift and an additional means for me to worship my Savior! Drumming also is a way to reach young people by sharing it to them! Grad of Mapua B.S. IT, currently working nyt shift for Sprint USA. Fulltiime church worker during week ends. My musical influence/s: kahit anu na naririnig ko may influence sa akin in some way. i'm really trying to listen to lots of different kinds of music. i like funk, prog, metal, jazz, or fusion nung lahat ng nun. I'm a proud drummer because: i love playing the drums, and ito yung instrument na talagang gusto kong i-master sa buong buhay ko. sikat pero malulupwet!!! tulad ko!! wakokoko joke!! nyak,, cheap lang drums ko.. hehehe pero bigtime ang drum HEAD!! "palo lang ng palo" --nyek..
GODBLESS US!!!! GOD OF ROCK!!! Nasaan na yung mga iba?? Post na, mga kapatid!! My favorite drummer/s: gadd,mayer,weckl,beauford,donati,portnoy, dami pa talaga! I'm a proud drummer because: makes me happy. I'm a proud drummer because: this is my bread and butter now because my work is all drum and cymbals related..hmmmm...they say its the drummer who gets the most chics..
My favorite drummer/s: aba, xempre daddy ko, Florante Mendoza the original drummer of the Jerks, at ng Banyuhay ni Heber Bartolome..
My musical influence/s: Earth, Wind & Fire @ mdami pa..
My drum gear: as of now laser drumsticks p lng eh 8A, then zildjan 7A, drumstick bag xempre..hehe..
My drum gear: nabenta ko na yung kita ko dati.. i'm starting all over again.. Vic Firth Stick at Avedis Crash pa lang.. I'm a proud drummer because: because of the chicks roaming around you.. I'm a proud drummer because: drumming is the key for eternal happiness and emotional extravaganza that we experience!! My fave musical style/s:mainly ROCK, pero i'll listen to evrything!!! My Musical Influence:all the music made by the guys on the list above(an incomplete list though,its a very LOOOONG list).I pick up sumthing new on evry song i listen to. I'm a proud drummer because:helps me to lose weight?naaah! it's beacuse one of the things i learned on my own,and i'm very proud of that achievement! I've been playing drums since 1993. drumming led me to my current love for studio recording and mixing. Drumming has made me extra conscious of the fact that the most diffiult instument to record in a modern band setup is the drumset. being a drummer makes me extra obsessive on getting good drum sounds. 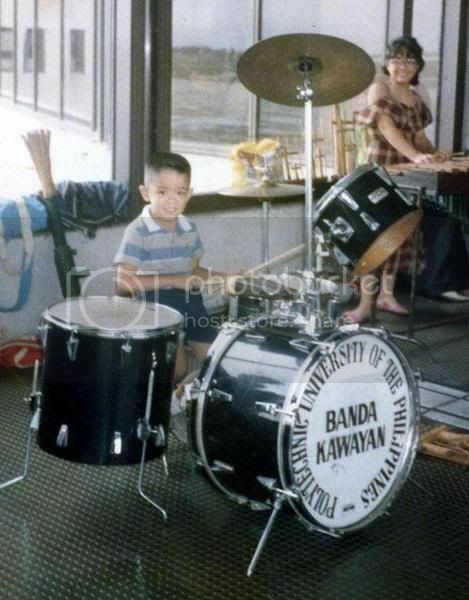 My musical influence/s: My dad; Conductor & Instrument maker of Banda Kawayan. My Grand dad; Conductor, Paete Laguna. The world. I'm a proud drummer because: I get to meet new friends on and off stage!!! Additional info about myself: Multi-instrumentalist! 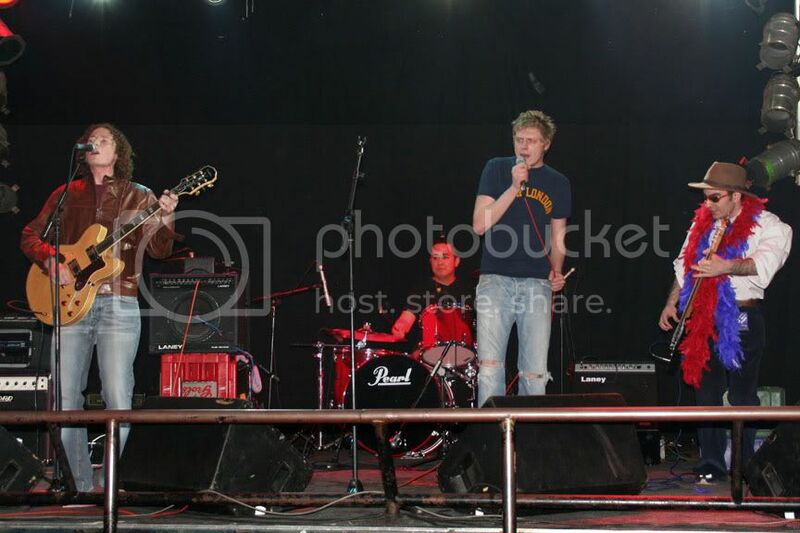 Back-up Vocals! Drumming since 14, on and off. Favorite drummers: almost all drummers mentioned by the previous posts. plus my teacher for the first 3 years of learning the instrument. Musical Influences: many too mention!! plus my brother!! Drum Gear: hmmm... hindi kasi sa akin. kaya as of now, isang pair ng 8D vic firth. I'm a proud drummer because drumming makes me who i am! And i am pretty certain that drums will never leave you. 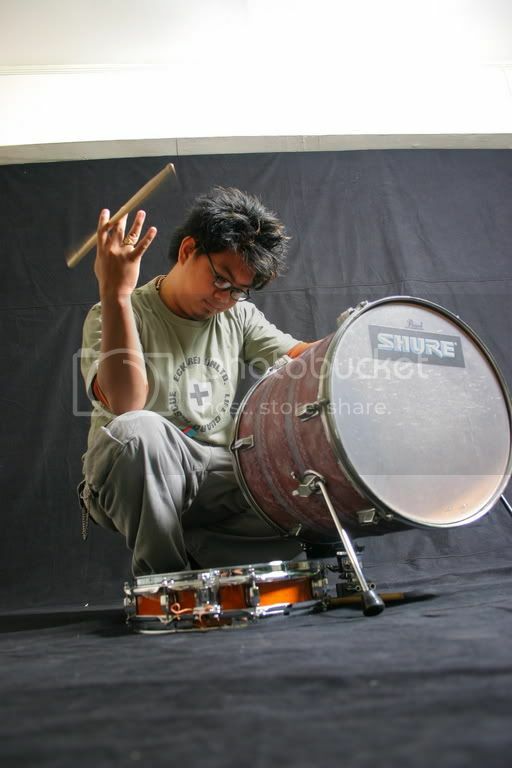 My favorite drummer/s: Mark Escueta, Tony Royster, Jr.
My favorite musical style/s: Rock, Punk, Pop, Ballads, Dami pa eh!! I'm a proud drummer because: I have God in my Heart and a pair of sticks on my hands. Additional info about myself:I'm a 24 addict!!!!! My favorite drummer/s: Shakira!!! yes she plays! Additional info about myself: I had no teacher, just watched a bunch of instructional vids and tada! My favorite musical style/s: Funk, Metal, Rock, Prog.. I'm a proud drummer because: It's the best thing to do. we also create the groove & foundation of our songs. Additional info about myself: currently learning to play guitars, swiming and drinking..